Purpose: Use this document as a reference for initiating a return to a supplier or vendor in ctcLink. 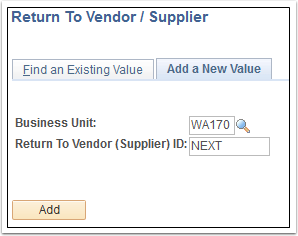 In the Return To Vendor (Supplier) ID field - leave the default value of NEXT (unless your business practice directs otherwise). On the Maintain Return to Vendor / Supplier page, click the Select PO link. Enter or select the PO number in the ID field and then, click the Search button. Note: If you do not know the PO number, you can enter the Supplier, or other search criteria to assist in a search to help you locate the PO number. Select the PO you are returning against and click the OK button. Credit (return for credit): The goods are to be returned to the supplier, and no replacement of these returned goods is requisitioned. Exchange (return for exchange): You are returning the item, and you want a different item to be sent to you. This option triggers a Workflow event to a buyer. Replace (*return for replacement): The returned materials will be received against the original purchase order again, after the supplier ships replacement goods for the returned items. Use the Disposition drop-down button to select the appropriate disposition for the return. Enter or select a return reason in the Reason field. If appropriate, enter an RMA number in the RMA Number field. If appropriate, enter the RMA line number in the RMA Line field. If applicable, enter the return quantity in the Return Qty field. If applicable, enter the ship quantity in the Ship Qty field. 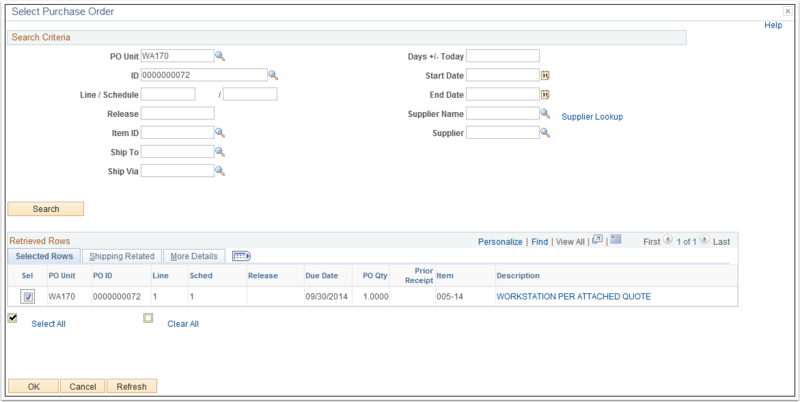 If applicable, enter or select the ship date in the Ship Date field. The RTV ID field now has the RTV ID number assignment. In working with Ciber during First Wave training, we were advised that this program was intended to return stock merchandise with item numbers to the distributor. As this is NOT the SBCTC business model, we were advised to handle returns offline (manually, not thru ctcLink). Has this advice changed? A finance functional analyst provided the following comment: "We are utilizing the RTN functionality in PeopleSoft."